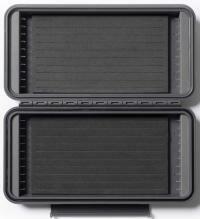 The Plan D BOAT box provides the next level of storage. Whether you are packing for a longer trip or you simply want to bring enough selection to have all of your bases covered, the Plan D BOAT box offers enough storage capacity to get the job done. Comes with an external drying pad. One side of this box is equipped with our patent pending design for holding up to 28 of your favorite articulated flies. The other side is good old fashioned slotted foam. 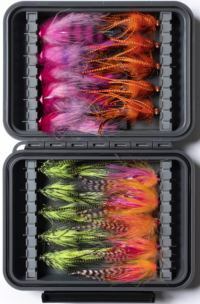 This box allows you to store a combination of articulated and standard flies to ensure you have all of your bases covered. Just plain old slotted foam on both sides. Plan D quality, made in the USA. 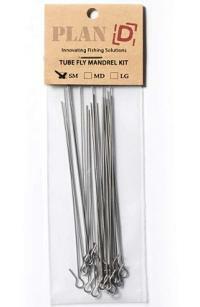 They are incredibly durable and will keep your flies secure and dry in the harshest of environments. The Plan D Pack Max Articulated Plus utilizes their patent pending design for storing up to 40 of your favorite articulated fresh or saltwater flies. 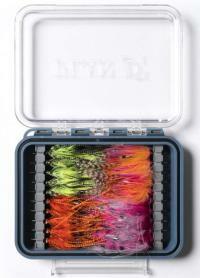 Simply slide the eye of the fly onto the stainless steel hook and insert the flys hook into the slotted foam. Equally at home in a boat bag or stuffed in the top of your waders, this is the box you need. The Plan D Pack Max Tube Plus uses their patent pending design to hold up to 40 of your favorite fresh or saltwater tube flies. Includes two medium mandrel kits. Plan D Pack boxes are built with high quality components and a weather-resistant seal. 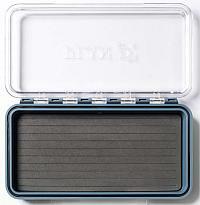 They offer both clarity and durability and will keep your flies secure and dry in the harshest of environments. 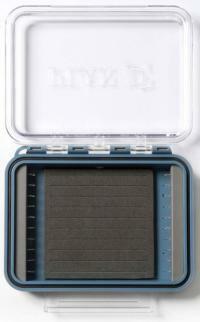 The Plan D Pack Standard is a great all purpose slotted foam box for medium to large fresh and saltwater flies. 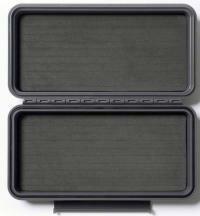 Equally at home in a boat bag or stuffed in the top of your waders, this box is a workhorse and hard to beat. 9.54 x 5.22 x 1.41. 6.59 x 5.22 x 1.41. 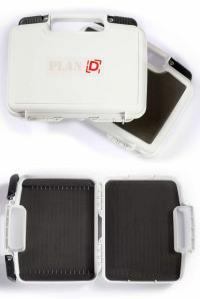 Plan D Pocket boxes are built with high quality components and a weather-resistant seal. The Plan D Pocket Articulated utilizes their patent pending design for storing up to 10 of your favorite articulated fresh or saltwater flies. The Pocket is the little brother to the Pack and the perfect box when you want to travel light. The Plan D Pocket Tube Plus holds up to 20 of your favorite fresh or saltwater tube flies. Includes one medium mandrel kit. 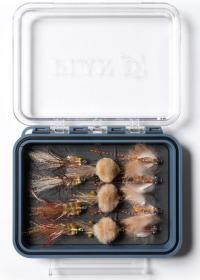 The Plan D Pack Tube Plus holds up to 20 of your favorite fresh or saltwater tube flies. Plan D's Mandrel Kits are made from 316 marine grade stainless steel and come 20 mandrels per bag. *Please note, some commercially tied flies are tied in a manner that compresses or crushes the tube and may prevent them from fitting on a mandrel.